IN AN OBSCURE WASH in the high Mojave stand two domes, their north faces steeped in shadows. Four friends scrutinize the rune-like creases on the northeast face of the northernmost monolith, searching for a path up the steep wall. They are young, in that boggling interval between adolescence and manhood. 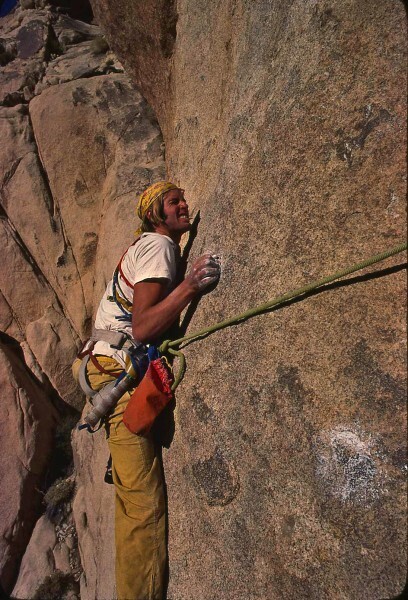 Much later, they’ll remember the time as a golden age, and how their fellowship produced some of Joshua Tree National Park’s greatest climbs. In that spring of ’78, Craig Fry, David Evans, Randy Vogel, and Spencer Lennard would work on the new route, a project that would take three long days spread over seven months. Only Evans and Vogel would finish it. On that day, finally on top, they’d gaze at the yawning expanse of corrugated rock and twisted shrubs, sort out their gear and start their descent. Already the details of the climb would have begun the slow, sinuous slide into memory. Over the next several decades, remnants of the experience would gyre within their minds, where all recollections transform, increasingly, into artifacts of imagination. 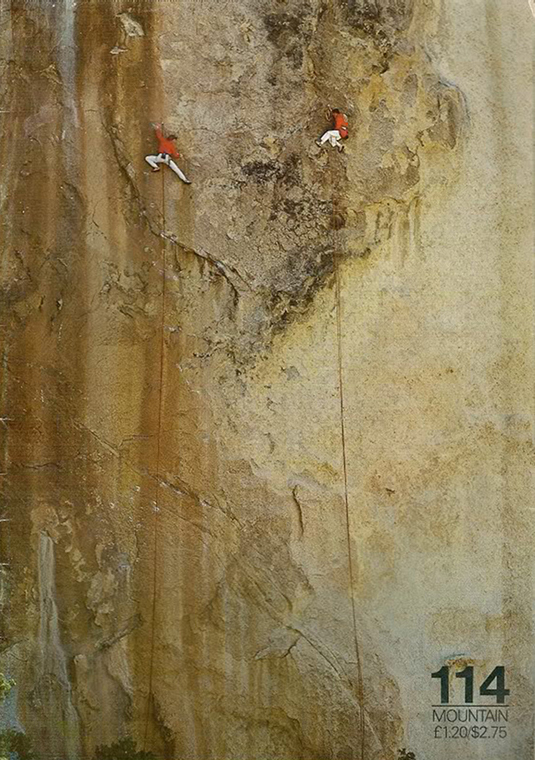 IN 1987, THE COVER of Mountain magazine featured two climbers performing a kind of pas-de-deux across an immense wall of muted ochre rock. The dark-haired belayer lounged from a three-bolt anchor, and held the rope loosely while his blond-haired, balletic follower traversed a heart-shaped bas-relief. They each wore blood-red shirts and pants white as sun-bleached bone. Figures on a Landscape: that was the name of the climb, as well as the title of the photograph. Galen Rowell had captured Skip Guerin and Ron Kauk as they repeated the route almost 10 years after the first ascent. A raddled copy of Mountain 114 made its way through the small, youthful San Diego climbing community of which I was a part. Intrigued and entranced by the photograph, we all talked big about becoming a figure on that landscape. Soon enough, I did. I knew nothing, then, about the stories of Fry, Evans, Vogel and Lennard. 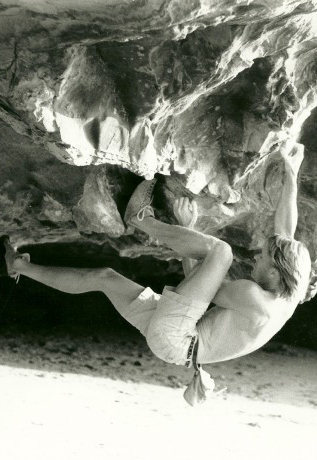 But twenty-five years later, an online search led me to a climbing forum that contained a welter of conflicting narratives about the route’s history. The four men joked with one another, dissed and were dissed, and apologized in turns as they shared wildly skewed memories about the route’s creation. Intrigued—and then obsessed—I reached out to each of them to try to understand the fissures between a thing done and its telling. BACK IN THE LATE ’70s—when Joshua Tree was still “the Monument,” before concrete curbs kept Winnebagos from straying onto the fringe of the Mojave, before the Park Service built the new asphalt lots and prettied up the outhouses—a few dozen climbers from California’s Southland met every weekend in Hidden Valley Campground. They called themselves the Sheep Buggerers, the Joe Boys, the Scumbags, the Uplanders and the Orange County Crew. Like the famous Stonemasters who preceded them, these groups were mainly composed of middle-class suburban kids. Some learned to climb through the YMCA, others from big brothers, through the Scouts or from one another. All of them had spent time at Rubidoux, Corona del Mar, Stony Point, Woodson and Big Rock where they calloused their fingertips, developed their heads, but mostly learned to see. Their partner Matt Cox passed around his careful notes of new climbs. 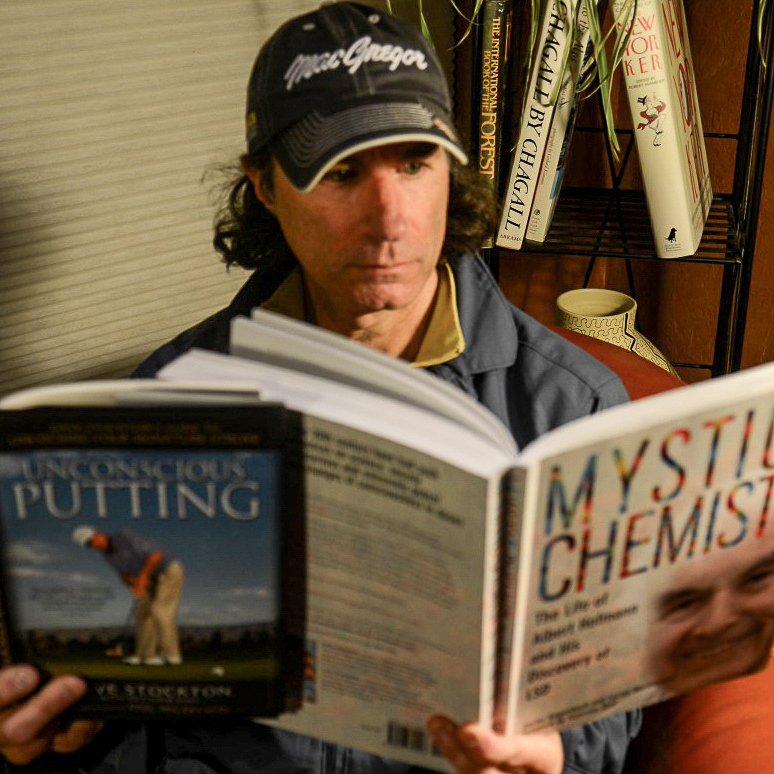 After Cox left, Vogel kept adding to his records, collecting information in a spiral-bound notebook that he called “The Toad’s Guide” and that he’d later develop into his well-known guidebooks. Meanwhile, he brooded about the dome in the Wonderland of Rocks. There was a way to the top that looked hard but might be done in pure style—a chance to create a multipitch climb that said something. THE WONDERLAND OF ROCKS is Joshua Tree’s emblem of wilderness, a twelve-square-mile granitic keep crosshatched with sandy washes and sharp-clawed vegetation threading hulking stands of quartz monzonite. Its labyrinthine jumbles resemble Stygian caves. Stunted oak and single-leaf pine cast eerie penumbras into deep alcoves. Ravens roost on varnished cliffs. There’s a sere light that lends itself to thoughts of older, spiritual journeys. 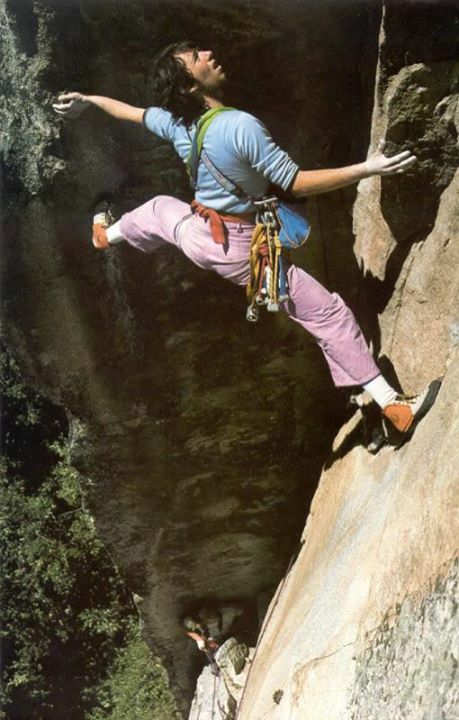 In the ’70s, only a few climbers ventured into the Wonderland’s depths. A handful of routes existed on South Astro Dome. Fry told me that he first glimpsed the line that became Figures on a Landscape from Such a Savage, a thin face climb that he and Lennard established in 1977. Vogel said he scoped Figures separately and showed it to Evans. Others likely ogled it too. “Anybody who was doing any of the routes on South Astro Dome would naturally just walk right by the base of the North Astro Dome all the way around,” Vogel explained. There’s a big difference between admiring a block of stone for its beauty and seeing it for its creative potential. If you want to lay claim to the entire arc of a route’s authorship—from imagination to realization—then beginnings matter. And this, perhaps, is where the memory skew starts. I called Vogel. “Unlike some I don’t claim to have a perfect memory,” he said. “I know Craig’s memory is that I wasn’t there at that particular time. But be that as it may, that’s not correct.” As to the claim that Fry and Lennard put in the first few bolts alone: “That’s total fantasy.” I asked him if he was sure Evans was there. “Oh, God, yeah.” But in an account published in Vogel’s Joshua Tree Classics, Evans made it clear he wasn’t there. 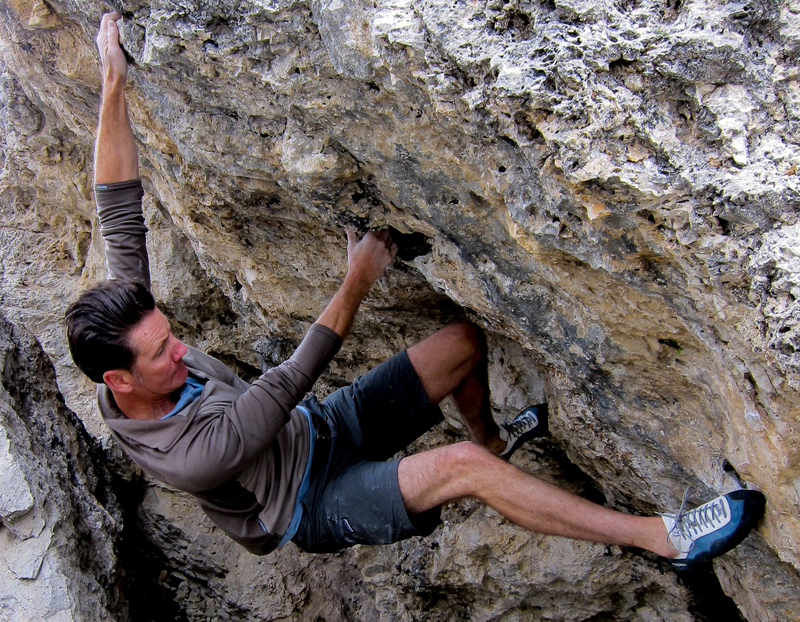 “Spencer, Craig and Randy had started the route a week or two before and placed the first two bolts on that day,” he wrote. When I got Evans on the phone, I asked him when he first saw the route. “All I remember is Randy showed it to me. It wasn’t the first day that people had been there,” he said with a laugh. There are other disagreements: Vogel said that he drilled the route’s first bolt, but Fry claimed he did. Vogel said that Evans placed the second, but Fry told me that Lennard did. Evans produced photos that he claims showed him placing the third and fourth bolts, thus refuting Fry’s assertion that he placed one or both of them. There’s also confusion about whether the route’s second day of activity occurred in April or November and thus whether the summit day came after a summer-long or weeklong wait. Lennard left the area for college, so he wasn’t around on the second day on the wall. On that day, as they made their way to North Astro Dome, passing the Seuss-like plants and the lunar rocks, Vogel described his vision of unimpeachable style to Fry and Evans: They would use no hooks to drill the route’s bolts. All bolts would be drilled on lead from stances. Anyone caught hanging from a hook would be pulled off the wall. If that meant a horrific fall, so be it. Either Fry or Evans placed the third and fourth bolts. Each one required twenty minutes of drilling with half-swings of the hammer, the bit nested between thumb and hand with remaining finger pads incised onto edges. Then it was Vogel’s turn. Above the fifth bolt, he launched across the traverse captured by Rowell’s photo. He slotted a rattly nut behind the flake and sidled up and right for about fifteen feet, when the rock steepened and the holds petered out. From there, he’d have to make a full-wingspan tilt for the rim of a ledge and try to mantel. A mistake would mean falling more than twenty feet before the nut popped and sent him for another forty-foot swing. Evans paced below, beseeching Vogel to find protection. Vogel retreated, ventured back, vacillated and returned to the flake. Suddenly Fry and Evans heard the tapping of metal on metal, and they looked up to find Vogel dangling from a hook attached to the flake, drilling a bolt. They screamed at him, cursed him, and threatened to pull him off the route, which would have sent him swinging 40 feet . Vogel begged for mercy. They relented, allowed him to place two two quarter-inch bolts, and lowered him to the ground. Sobered, they retreated from the Wonderland.“It was probably the ultimate in hypocritical acts,” Vogel told me. On the third day, Vogel tiptoed through the runout and slammed in a few bolts higher up. Evans led the corner to the top. They’d done it. Blinking in the desert light, Vogel had an intuition, already, of what the route might become. They’d been calling it “Monkey on My Back,” yet in his 1981 supplement to the Wolfe guide, Vogel renamed it Figures on a Landscape, inspired by an obscure film, Figures in a Landscape. The poetic new title, with the slight substitution of on for in, seemed to capture something essential to the art of climbing.“We were figures on a landscape,” Evans told me. The unusual beauty of the stern line so evocative of an abstract painting, the ground-up ethics (despite the hooks) and the relatively scant bolts turned it into a symbol that, with time, came to represent the zeitgeist of its era. “In the scope of things, it’s probably pretty insignificant to the world. But as a personal experience, it’s very significant,” Vogel said. 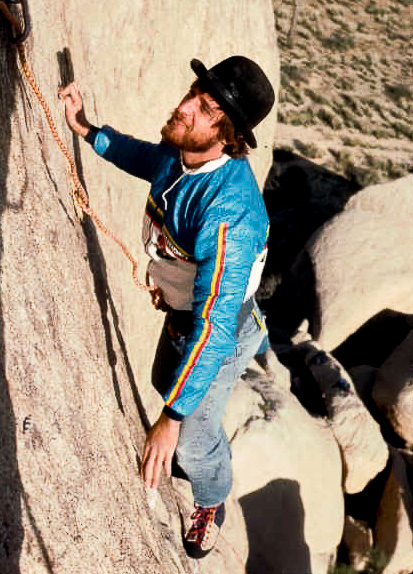 “IT’S A CRUMMY LITTLE crag climb in Joshua Tree, right?” Kerwin Klein said with a chuckle when I called him. Klein, a history professor at Berkeley, has written treatises on memory. As a student, he spent time in the Hidden Valley Campground. He’s climbed Figures on a Landscape more than once, and he even participated in the Figures Supertopo thread. I asked Klein what happens when historiographers are confronted with disparate accounts. Most lay climbing historians, he noted, gather narrative accounts without testing them. Academic historians critique sources, compare evidence and submit papers for peer review. Even so, the description of an incident can’t ever be fully definitive. Klein mentioned a classic example in Arthur Danto’s “Narrative Sentences”: prior to 1648, no one could have called the conflict between France and the Habsburgs the Thirty Years War. In other words, an actor has no knowledge of the swath of events that might unfold while she’s in the midst of them. OVER TIME, Vogel told me, he realized that the assemblage of the conflicting Figures stories might create an entirely wrong, but entertaining fable. I suggested that, woven together, the skeins of memory weren’t unlike Akira Kurosawa’s masterwork, Rashomon, in which four witnesses to a homicide relate wildly different accounts of how it was committed. “I could only hope!” Vogel said with a chuckle. “But yeah, that’s kind of the idea.” In a way, that über-narrative already exists: the four versions are now “encapsulated in the climb”—part of the layers of myth that seem to permeate the stone. We all believe we know who we are—as communities and individuals—based on memories of who we were. But if a truth foundational to identity is proved false, then who and what and where are we? Adrift, we become exiles in our own skins. Desperate for definition, we often attempt to anchor to that which is solid and sincere and infallible. Climbers tend to return to stone. IF, SEVERAL MONTHS AGO, you’d pressed me to recount the day I climbed Figures on a Landscape, I’d have told you that I had little memory of it, apart from my pride in a solid lead of the second pitch. I’d tell you that after passing the crux, I launched off on dozens of feet of incuts protected by a single bolt, and I built a belay to bring up my second, who wasn’t a regular partner, but someone I met in Hidden Valley Campground and never saw again. I’d tell you that we got to the top without any falls and hiked out of the Wonderland at dusk. I’d also tell you that my memory of Rowell’s portrait was far better than that of my own time on the wall. This was, of course, impossible. I must have annotated the book some years after climbing the route, and somehow erred in my haste. “Led second pitch, followed first and third pitches”—that’s what I meant to write. Then I contrive a murky image of a young climber removing a gear sling and passing it to a faceless partner. Could it be? Definitely not. I recall too vividly the frisson of casting off on an up-trending traverse, the sure bite of varnished edges, the weft of purplish braids arcing from harness to belay while I expulsed the phantasm of a huge pendulum fall. Mostly, I remember transporting something ineffably precious from the Wonderland that evening and enveloping a life within it—not an experience with which I’d willingly part, then or now. Did I lead the second pitch or follow it? Did Fry and Lennard climb alone or were all four present on the first day of Figures? There’s only one possible answer, of course. Brad Rassler’s writing has appeared in Outside, Sierra, Alpinist, Ascent, and other outdoor publications. He and his longtime partner, Jane Grossman, live in the foothills of Nevada’s Carson Range, where they raise neither children nor chickens. Brad is the Editor in Chief of Sustainable Play. This story originally appeared in Alpinist Magazine (#52). Many thanks to Alpinist’s Editor-in-Chief, Katie Ives, who helped mold this piece, and to Adam Howard, Height of Land’s CEO, for his permission to reprint it. Tradition has it that all who made significant contributions to the first ascent should be given credit. Even if they did not top out the first day. And a big thanks to Gary Schwartzenberger too.